Revaluation Results of April/May 2015 Examinations(8th Semester) is Published. Candidates can apply for Review of Answer Scripts from 02-07-2015. The last Date for Students is 08-07-2015. Withheld for want of approval of admission / readmission / transfer from DTE & Director, Student Affairs. 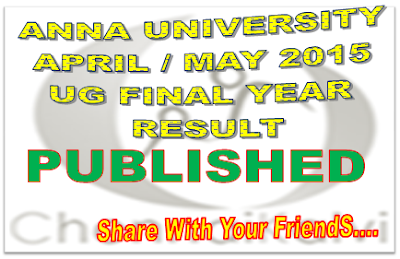 April/May 2015 Examination Results (Eight Semester) Published. Colleges can apply Photocopy. Last Date for Applying Photocopy, for the Students is 30-05-2015 and for the College is 01-06-2015. The Web Portal will be closed by 06:00 pm on 01-06-2015. Result Published in the Following Link. Anna University Affiliated College UG / PG Students, who are not yet know their Internal Marks on Anna University Examinations April / May 2015, can check their Internal Marks and Attendance Status of the University Exam April / May 2015 at the following Link.